Toledo Basement Repair helps customers to identify water problems in commercial and residential locations in Toledo & Maumee Ohio and all surrounding suburbs including Sylvania, Perrysburg, Holland, Oregon and Rossford. We are able to diagnose foundation water problems and fix them before irreparable damage occurs. If you have observed rust forming, cracks in the floor or walls, or mildew becomes evident, you need to have your foundation checked by our in-house certified specialist. At Toledo Basement Repair our Chief Project Specialist has a degree in civil engineering and is a certified Symons Architectural and Remodeling Contractor. 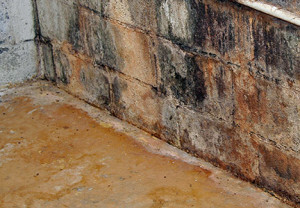 We know what to look for to identify foundation water problems. 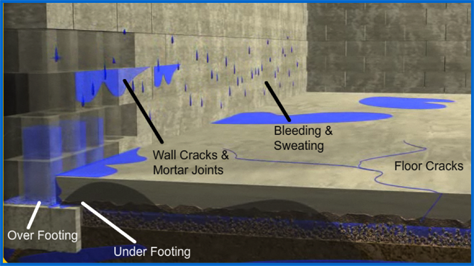 Factors that determine the extent of your water damage depend on the type of foundation you have. Residential or commercial properties foundations vary in construction. For homes or businesses that have basements, you may observe damp spots, water seepage, or a musty smell. If the foundation is a slab you may observe paint peeling, condensation on the windows, or mold may begin to grow on the walls. We offer our customers permanent solutions to their water problems. We utilize the latest technology to ensure that you will no longer experience chronic basement leakage. We specialize in diagnosing where your water problem is coming from. We then create a plan of action to perform a high quality basement or foundation repair. We stand by our work. Contact us today at (419) 297-6138. 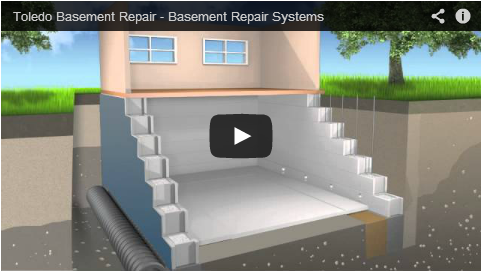 For more information check out our Demo Waterproofing Video which will show you various types of basement water problems and the innovative solutions that we offer here at Toledo Basement Repair.